First off, I should say I am a very demanding customer when it comes to historical novels set during the Napoleonic Wars. 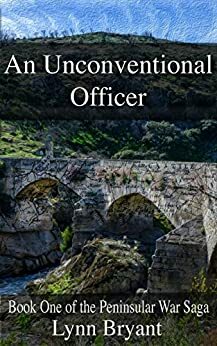 I also started this one off wondering what a man like Paul van Daan was doing in the early 19th century British army, and it did strike me that "unconventional" could easily cross the line into "anachronistic". Thankfully, Ms Bryant is a much, much better writer than that. She has clearly read widely and deeply about the period -- not just the military history parts, but also the general mores and ways of thinking and acting, and this knowledge is obvious throughout. Paul had started to win me over about a tenth of the way through; by about halfway, I was probably a little in love with him. I bought this because I have recently been on a battlefield tour of Spain, and visited Talavera and the site of Crauford's action on the Coa River, both of which feature in this book. However the book is far more than a Sharpe-style story of battles, it also populates the ficitious battalion with very likeable officers and NCOs, and a few mouthy privates, and has a suitably nasty villain. It's a longish book, but I was hooked. I'll be buying more, but not right away or I'll get nothing else done! glad I read it and will read it's sequel. Thank you for an enjoyable read. I really enjoyed this gripping tale; a mix of adventure and romance set in the early years of Wellington's Peninsular Campaign. It was well researched; the author managed to avoid letting her evident deep knowledge of the period overpower the thrust of the story. I loved the characters; Paul van Daan is an engaging and flawed hero, making him very believable. I look forward to reading more of his adventures. 5.0 out of 5 starsBest type of romantic, exciting fiction. I loved this book and found it very difficult to put down. It was exciting and in parts very moving. It made me laugh and cry. A wonderful (if flawed hero), a strong female heroine. What more could you ask for. You want a book to take you out of yourself and away from all the niggles of daily life - then this is it. I will definitely read the next two. Great mix of historical military fiction and epic romance.